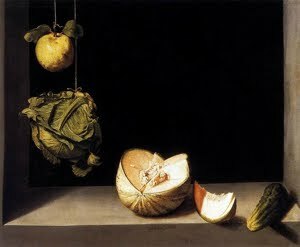 NOTE: This week's post is a cross-posting from The Veg Table, a blog by Signe Porteshawver. Signe is a recent Tufts graduate who wrote a great senior honors thesis on Community-Supported Agriculture and who's now working at Drumlin Farm in Lincoln, Mass. This post seemed to follow really nicely on my own thoughts last week about questions relating to scale in local and regional agriculture, and Signe graciously agreed to let me cross-post it here. As passionate as SSE is about saving seed, Ott Whealy admits the lack of political drive within the organization. 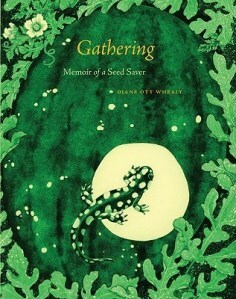 It is certainly political in Berry’s sense of home economics that I discussed above, and to Schumacher as well, but Gathering did not bring up how seed saving can help change the way food is grown in this country in a big way. SSE does compile a directory of commercial seed companies that offer non-hybrid varieties. The catalogue is called the Garden Seed Inventory and is no doubt a great resource for gardeners and perhaps commercial growers as well. However, saving seed and choosing heirloom varieties becomes harder at a larger scale. This blog isn't going to turn into one of those this-is-what-I-planted-today-and-this-is-how-it-made-me-feel things. Promise. Its purpose is to help me think about the intersection of critical historical study and the local food movement, and I'm going to stick to that. But since I'm trying to be more local in where and how I use my critical/historical skills, as well as where and how I get my food, my own place comes into the picture to some extent as well. That place is in Wendell, Mass. (pop. 850), in a new house that we moved into just over a year ago. We're newcomers in town, although we've lived in the area for 25 years. Now that we've gotten through the house-building process, I'm now obsessing about building a garden--literally building it, because the soil in our part of Wendell is inhospitable at best. I've been learning from experienced growers around here who have created thriving small farms and large gardens on equally inhospitable land--people like Sharon Gensler in Wendell, Ricky Baruc and Deb Habib of Seeds of Solidarity in Orange, and Dan Botkin of Laughing Dog Farm in Gill, among many others--and have been working on no-till "lasagne" beds and season-extending techniques (currently just a small cold frame, but I'm also trying to make a moveable hoop-house system). We recently finished setting the last of the black locust fenceposts--"Nature's pressure-treated," according to the website of the forester we got them from. After years of container-gardening, it's a huge treat to have a big sunny space where I can really grow food. It's also a treat to be here because there are so many smart people in the area who are engaged in re-thinking and reinventing our food systems. Wendell's well-deserved reputation as a hub for "alternative" ways of living is one of the things that made me decide to use this as a base for developing a "historical food-mapping" project, which I'll be launching later this spring. My plan is to start with a series of large town maps from different time periods and to invite people in town to add about what they and others have grown on particular pieces of land over time, with the goal of building up a more detailed picture of the networks of food production and exchange that Wendell has historically been part of. The town cultural council has given me a small grant for supplies, and I'm hoping to gather enough data this spring and summer to give a sense of what kinds of additional research might help to fill in some of the blanks in the picture. I was originally envisioning this as having a purely local focus, in keeping with the widespread notion in "transition" and "relocalization" circles that places need to become more food-self-sufficient as a strategy for resilience in an era of peak oil and climate change. My ideas are already morphing on this, though, in large part through listening to historians and food activists like Brian Donahue who are arguing that regional self-sufficiency is actually a smarter strategy to aim for, as well as more closely reflecting historical patterns of the pre- and early-industrial eras. And that makes me think that these food-maps should keep an eye open to larger scales, probably by asking not only what people have grown here in various time periods but also what food they've bought and from where. One crucial piece of history for this project is the story of why places like Wendell stopped being mainly agricultural over the course of the 19th and 20th centuries. 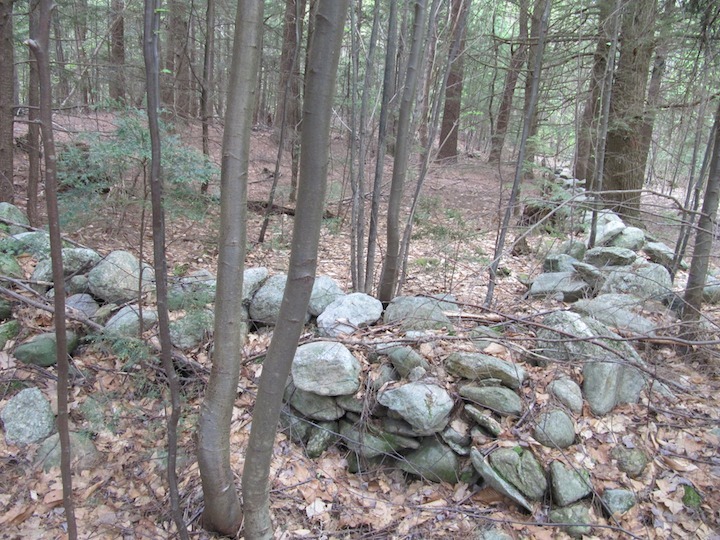 I can see this history just by looking out the window: as with many places around New England, Wendell's woods are criss-crossed with old stone walls that speak of farms past and abandoned. 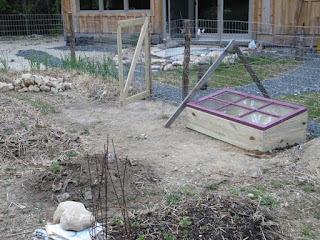 The rocky soil is a big part of this story; my no-till raised beds are a solution on a fairly small scale, but once agriculture became more commercialized in the early 19th century, those people who were still trying to make a living farming began to struggle with the very real limitations of this landscape. You can actually produce food in an intensive way here, but it's labor-intensive to do it, and it doesn't work on a large commercial scale. And of course that connects to a whole raft of issues relating to how we work and travel and eat--our whole modern, consumption-driven, energy-intensive way of living. So as I start to develop this local food-mapping project, I'm thinking that it's going to be as much about scale as about localness per se. What evidence is likely to be out there for Wendell's involvement in regional-scale agriculture in the 18th and 19th centuries? 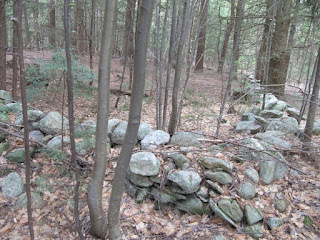 And what can be discovered locally about the pivotal moments (like the official designation of some environments as agriculturally "submarginal" in the 1920s and 30s, leading to reforestation and the creation of places like Wendell State Forest) when the scales changed radically? Stay tuned--I hope to be able to report on some of this over the summer! For an article on how the "submarginal lands" designation played out in neighboring Vermont, and how some farmers resisted it, see Sara M. Gregg, “Can We ‘Trust Uncle Sam’? 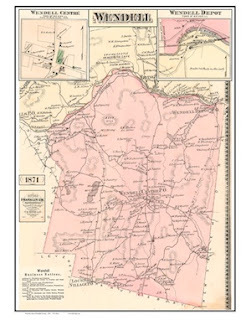 Vermont and the Submarginal Lands Project, 1934-1936,” Vermont History 69 (Winter/Spring 2001):201-221, available as a PDF here. 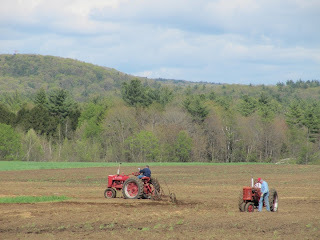 Driving back from running errands yesterday, Fred and I noticed a sign on Route 202 near the Hunt Farm in Orange: "Plow Day." 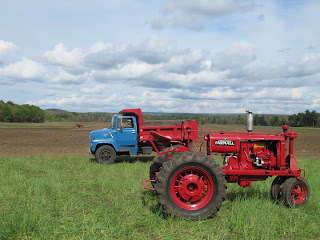 When we stopped to look, we saw that a number of antique tractors were crossing and re-crossing the big field where George Hunt grows feed corn for his dairy cattle. I already knew that there's a whole sub-culture of tractor collectors and enthusiasts. I didn't realize, though, that some of them--in this particular case, Chapter 18 of the International Harvester Collector Club--periodically converge on a willing farmer's field to practice their plowing skills or just (as one man put it when I asked him about the event yesterday) "to play" with machines that they wouldn't otherwise get a chance to use. A bit of Internet research on Plow Days turned up a definition, some similar events using draft animals, and a YouTube playlist of videos from around the country. (I wouldn't necessarily say that watching someone plow a field is less riveting than watching paint dry, but I did find that watching just a few of these more than satisfied my curiosity.) Closer to home, I found some video of the 2011 event at Hunt Farm and an article about 2010's gathering. This is actually proving to be a more complex event to wrap my head around than I thought at first. On the surface, it looks like a bit of old-fashioned reciprocity among farmers (or new-fashioned, if you compare it with the crop mob phenomenon among a younger slice of the farming demographic). I have land that needs plowing, you have a group of people looking for a place to use their tractors--hey, kids, let's get together and plow some fields! The fact that the tractors are from a previous era just seems to make it an interesting example of using older tools and skills around the edges of the present-day farm economy. But the hobbyist aspect makes this a somewhat different animal. 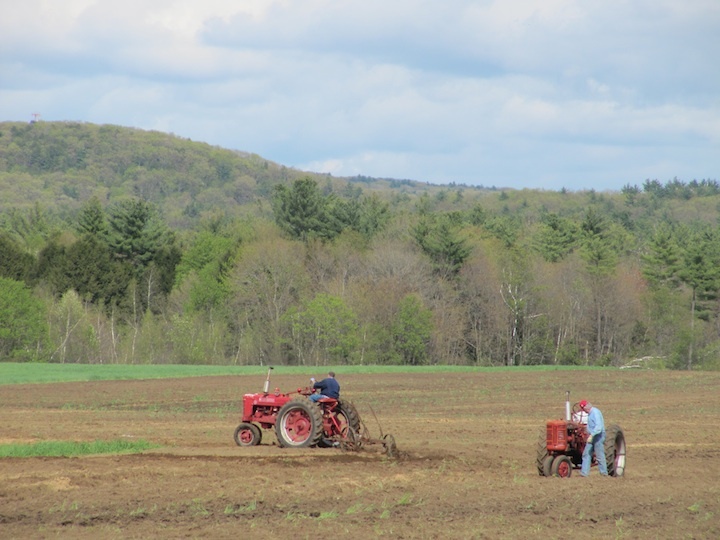 My guess is that the main reason the tractor enthusiasts are willing to volunteer their skill and labor is that it gives them a chance to do something removed from the realm of present-day farming. The old tractors are fun and collectable in large part because they're obsolete, and the reciprocity is strangely indirect. It takes a detour into the kind of antiquarianism that you encounter in living history settings, where people work to recapture the past for reasons of recreational pleasure, education, or self-discovery rather than for more utilitarian purposes. This is something quite different from choosing old machinery because you think it has some inherent advantages (as Tillers International does, for example). Still, it's interesting to think about how the "pastness" of the tractor collectors and the present-day operations of a host farm come together on Plow Day. It strikes me that this is a precise mirror image of a historic site that invites modern-day farmers to work its fields in order to preserve a historic landscape (something that happens, for example, at Cuyahoga Valley National Park in Ohio). This leaves me with the same sense of disconnection that frustrates me when I encounter it at historic sites--but at least the old and the new are butting up against each other within the same framework. When that happens, there's the possibility that someone will figure out how to take things a step further. And meanwhile, the fields are getting plowed and everyone is pleased--so even to my cynical eye, this seemed like a pretty happy occasion!